Dutch composer Tom Holkenborg, aka Junkie XL, has been quietly toiling for the past decade in Hollywood, contributing bits and pieces to films like Catwoman, The Dark Knight Rises and Inception. But in the past three years he’s really broken out, partnering with his friend Hans Zimmer on Batman v. Superman: Dawn of Justice and creating powerful original scores like Mad Max: Fury Road. Last year he scored the surprise hit Deadpool and he’s now working on both Justice League and The Dark Tower. 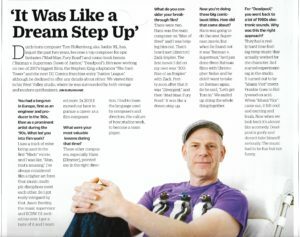 For a story in this week’s issue of Variety, I visited Tom’s studio and quizzed him about his past and future in films. This entry was posted in Composers, Film Music, Interviews and tagged Batman v. Superman: Dawn of Justice, Deadpool, Junkie XL, Justice League, Mad Max: Fury Road, The Dark Tower, Tom Holkenborg, Variety on February 7, 2017 by Jon Burlingame.